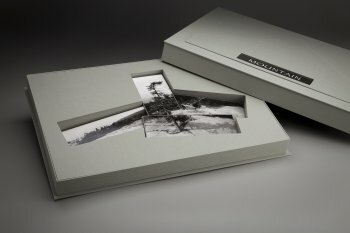 Seventeen mounted gelatin silver prints (each c. 3 5/8” x 9 5/8”) in 16½” x 24” x 2¾” mixed media hand-made box. 2017. Inspired by the “Imagined Landscape” series and my longing for hills on the Midwest horizon, this art show in a box suggests a game-like approach to photo collage.